People and the places they populate generate neighborhood character. I’m not talking about the franchise joints tested by marketing focus groups. I’m talking about your corner bar, barbershop, or back room, where, for whatever reason, people congregate. I like these places. The social fireworks are fun to watch. 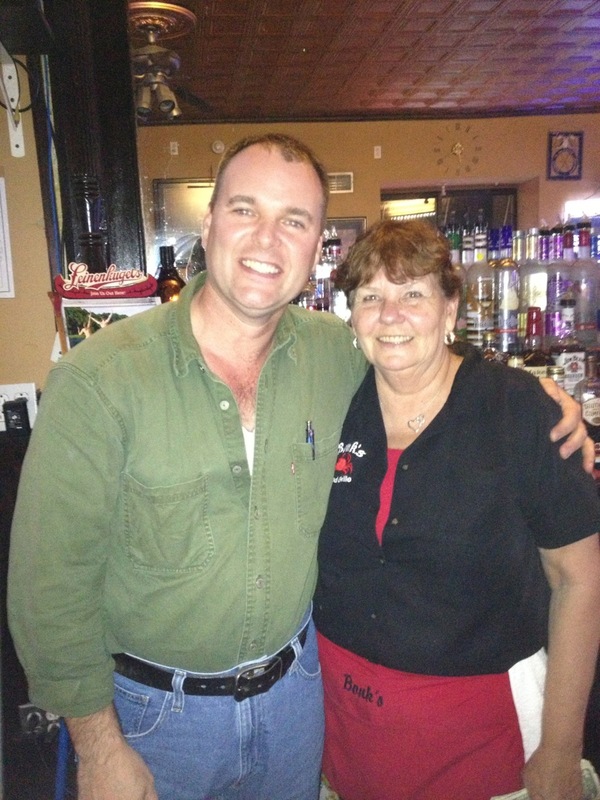 Hence, the photo of me with Sandy, the bartender at Bonk’s Bar. Bonk’s Bar features all the usual action of a corner tavern: local color, reliable booze, minimal interference from skyscraper geniuses looking to make everything the same. It’s been more than 20 years since I first set foot in there. Looking forward to many more years doing the same. Support your local establishments. They’re worth it. Here’s a sneak peek at the cover of Bonk’s Bar, my next novel. It’s amazing how well the designer captured many of the elements of the story in such a small place. Yes, there are spicy crabs and poker games in the story, not to mention Russian mobsters, live music, and a brawl or two. I love this cover. Let me know what you think. See my website for the first chapter. More info about the release of the book is coming soon. Bonk’s Bar, my next novel to be published, is complete. The photo below shows the stack of pages. Doesn’t look like much, but the whole story is there, from start to finish and everything in between. What a relief! Thanks to my editor, I made some last minute changes that truly improved the story. Happiness is having a good editor who makes you’re writing better, even when you thought you had the story exactly the way you wanted it. This has been a pleasant surprise for me during the completion of Bonk’s Bar, as well as An Island Away. Soon I’ll be working with her on my next novel. I’m looking forward to it. As you can see, I’ve switched from Coca-Cola Classic to Caffeine Free Coca-Cola Classic. The only reason for this switch is that I can turn down the amperage now that this novel is ready to go. I can cruise a little through the one I’m currently knee-deep in writing. Still, it’s Coca-Cola or water and nothing in between (except Jack Daniels but that serves a separate and distinct purpose). Enjoy your reading and check back for more updates.